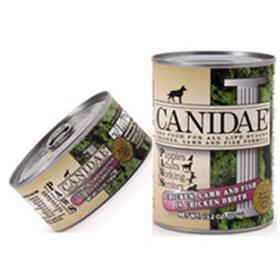 Proudly made in the USA from only the finest & natural ingredients, dogs love the taste of Canidae! Chicken, Lamb & Fish formula provides wholesome nutrition and superior digestibility for puppies, adults, seniors and overweight dogs. Rich in Omega 6 and 3 Fatty Acids, and ten skin and coat conditioners to help maintain a healthy coat. No Corn, Wheat, Soy, Grain Fractions or Fillers and Naturally Preserved. Canidae Chicken, Lamb & Fish formula meets the AAFCO Dog Nutrient Profiles for all life stages. Canidae is a great brand of food that I recommend for anyone who is on a budget but wants high quality nutrition for their dog.